How Well Do You Follow Directions? - Fun worksheet to print or read orally to students. How to build a spaghetti and marshmallow tower - follow these instructions to create a tower. How to Create A Fun Marble Artwork - follow these instructions to create your art. How to Make an Origami Bookmark - follow these instructions to create your bookmark. How to make paper beads for Altered Art - follow these instructions to create your art. Make me a Copy Please - [designed for grades 5-6] Lesson plan; the need to be articulate and precise when explain steps to another student. Identify and interpret essential details in passages and interpret minor or subtle details in informational and technical texts. 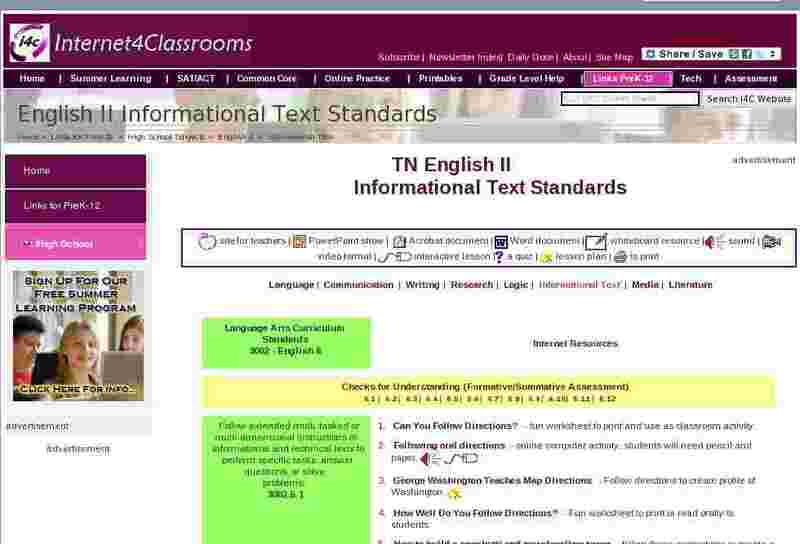 Identify the main ideas in informational and technical texts. Main Idea - The main idea of a paragraph is what all the sentences are about. Read the paragraph and ask, "What's your point?" Identify and distinguish the essential and non-essential details that support the main idea of informational texts. Recognize clear, subtle, or implied relationships among ideas in informational and technical texts. Draw appropriate inferences and conclusions in informational and technical texts. Summarize in a concise and well-organized way the main ideas and supporting details in informational and technical texts. Distinguish between a summary and a critique and identify non-essential information in a summary and unsubstantiated opinions in a critique. Examples of Good Critiques - article with questions to ask yourself while doing a critique. Speech Critiques Examples - great site with video of people speaking to critique, plus their critique on the speech. Speech Self Critique Guide - he following guidelines should be used in practice sessions to evaluate the speaker and speech and note possible areas of improvement. Synthesize information across multiple informational and technical texts and sources. Identify and analyze involved or unconventional organizational structures that may be found informational and technical texts. Ordering the Phrases - excellent interactive quiz - learn about the different stages of a presentation and to learn some phrases that tell your audience where you are in your presentation. Evaluate informational and technical texts for clarity, coherence and appropriateness of graphics. Discern the stated or implied main idea and supporting details of informational and technical passages. Make inferences and draw conclusions based on evidence from informational and technical passages. Use the graphics of informational and technical passages to answer questions. Determine the appropriateness of a graphic used to support an informational or technical passage. Identify an informational or technical text�s organizational structure. Differentiate between a critique and summary. How to Critique Creative Writing - simple guidelines to help you write a thorough, helpful review, and avoid common pitfalls in your own writing. Select the best synthesis of a given set of information.